We run introductory archery sessions, run by specialist instructors, for anyone from 8 – 80 years old. We are able to run sessions both indoors or outdoors (depending on location), and we will tailor the sessions and equipment to meet the needs of your group. Available all year round and perfect for primary and secondary schools, as well as youth groups and colleges. 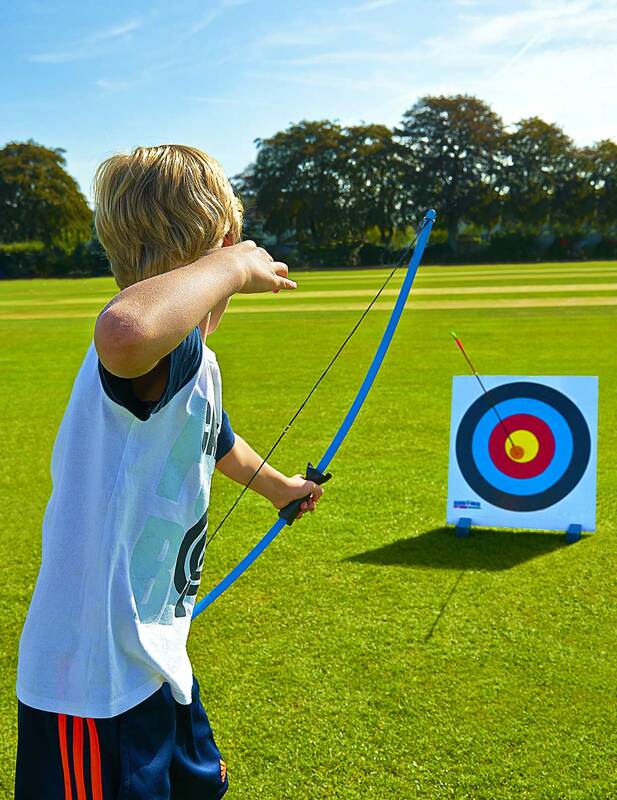 We run junior archery sessions with tailored equipment suitable for children aged between 5 and 7 years old. These sessions are easy to run both indoors and outdoors. This version of archery uses powerful bows and arrows with special suckers, endorsed by Archery GB, making it a great way to introduce the sport to young children. Available all year round and perfect for primary schools, youth groups and birthday parties. Adults and children aged 16+ – £350 for a 2 hour session including 1 fully qualified member of staff. This rate is for a maximum of 12 people. Children (8-15) – £300 for a 2 hour session including 1 fully qualified member of staff. This rate is for a maximum of 12 people. Due to Archery GB ratio guidelines, for groups larger than 12, a secondary member of staff would be required, increasing the costs by £80 for both age groups. To run archery at your venue we will require an outside area at least 100m x 50m in size. We can also run our archery sessions inside if you have a big enough sports hall or gym, as we will utilise our heavy duty netting behind our targets. Mini archery can be set up inside or out with limited requirement for space. We will come to your venue prior to the sessions to complete a full risk assessment and on the day we will bring all equipment to your venue. Please ensure you wear closed toe shoes, i.e. trainers/boots (flip flops, sandals, or crocs are not suitable). Long sleeved tops and active wear is also recommended, such as shorts/tracksuit bottoms, and a jumper in case the weather gets a bit chilly. If you have long hair, please bring a hair tie. Archery is a very safe sport, as long as the instructions given by our qualified instructors are followed. There are obviously risks involved when using real bows and arrows, however full risk assessments have been carried out for all our activities to ensure they are run safely. If you would like to book an Archery session, please fill out the form below and one of our team will get back to you to discuss your enquiry.